Learn how traditional business models transfer into the immersive tech space, and explore the intricacies of monetization. With ARkit, ARcore, and the new wave of untethered HMDs making immersive content more conceivable for developers and creators, immersive games and content are building a reputation as the next big thing. Investments are flowing from major VCs, both in tech and media, suggesting a promising future for a whole new medium. As VR/AR technology continues to develop, and more compelling experiences are created across a multitude of different industries, VR/AR is teetering on the edge of mainstream adoption. So how can you drive this adoption, create growth, and monetize these immersive experiences? Can traditional business models even transfer into the VR/AR space? The answer is a resounding yes. Though this evolving technology can be intimidating to some businesses, you have to remember that VR/AR is just another way to view content, and the opportunities are huge. Let’s first take a look at the business models of the gaming industry and what’s currently working for them. If you look at Playstation and Xbox, their current model is to provide users high quality visual experiences that can be purchased, downloaded, and/or played online. In mobile gaming, the most successful models are in-app purchases or premium subscriptions that access full experiences. If you think about how VR/AR can leverage these gaming models, it seems that leaning towards the mobile gaming model is a realistic choice. This is because it is difficult to convince someone to pay for such an expensive piece of hardware, and on top of that, still convince them to pay a premium price right up front. Providing a preview of content, or parts of an experience for free, like mobile gaming does, are great ways to get people on board with VR/AR more and more. Moving away from non-gaming content, technology innovation, cost reduction, content quality, and increased frequency of use, are all inflection points which will see further market adoption. In fact, high quality 360º video has developed immensely in marketing and storytelling. This content can easily be distributed through existing applications, and research shows that it also provokes consumers to watch and interact with this type of content, as well as motivates viewers to want to share, subscribe, and view other 360º videos. 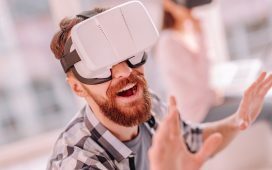 When it comes to business models to maximize this content, VR is being created as a companion to offer consumers additional experiences or value. VR/AR can very well be used as a pay-as-you-use type model. There is significant money to be made by organizations through location-based experiences on a global level. For example, in China, people’s first experiences of virtual reality is through high-end quality HMDs (head-mounted displays), and full interactivity at a VR Cafe, shopping mall, or museum. These location-based experiences are growing very quickly. However, in the United States, as another example, most people’s first experience is with 360º video or with . Sometimes they migrate to high end devices, sometimes they don’t. What we are seeing is companies like IMAX investing heavily in end-to-end solutions, in much the same way they did with projection. These content providers recognize they need to own the entire technology suite in order to deliver amazing experiences, and then we’ll start to see increased fields of view, high pixel counts, high bandwidth delivery, and high computational power solutions from these investments. Another company that is leveraging this is The Void, a mixed reality simulation. They have had the Star Wars experience in a few select places in the United States and UK, and are doing extremely well in terms of experience and revenue. An alternate new space within location-based VR/AR is marketing. If you can provide some sort of engagement or reward, and drop it in front of a storefront, people will buy into it. Just think of the power of location-based games, such as Pokemon Go. One of the biggest challenges stems from a landmark case that occurred in federal court. The aforementioned game, Pokemon Go, had created “PokeStops” in certain parks in the state of Wisconsin, causing a high increase in foot traffic that the city felt was damaging to these county parks. Some of the state’s leaders became upset over this amount of traffic, and introduced legislation that some in the VR/AR industry believe violates their first amendments rights. Even after the stops were removed from the game, the legislation stayed. The biggest issue with the legislation is that it ended up setting a precedent for businesses to fill out a variety of permits for their augmented reality experiences to be allowed within the city. Given this outcome, if other cities also decided to use this ordinance, it would be extremely difficult to scale an augmented reality company. A similar challenge could be asked regarding ads into any medium. The rise of ads on the web is undeniably intrusive, and vastly unwanted. More and more people skip ads when they can, install ad blockers, record television and fast forward through commercials, and overall try to avoid ads as much as possible. Smart branding marketers will be able to recognize that immersive content can provide a whole new medium where you can fully engage with consumers in a compelling way that has never been possible before. The opportunity here is to really harness the power of storytelling, and with adoption of VR/AR growing, companies are just starting to scratch the surface. An opportunity in advertising is to not be as aggressive as many companies have been lately, and turning off customers. Just check out the company Adverty, which is already helping the advertisers seamlessly integrate advertising into virtual and augmented reality applications. The best campaigns in advertising are the ones that use humor, or a social connection, and are not too intrusive. Ultimately, just creating a great experience that’s going to delight customers. In conclusion, with so much opportunity on the horizon for VR/AR technology and content development, now is the time to build the future of immersive technology and become a true industry leader. The business models today can bring forward the inflection point for monetizing VR/AR games and content. From premium to freemium and the impact of location-based VR/AR, your greater understanding of where VR/AR is headed will help drive adoption, create growth, and monetize immersive experiences.